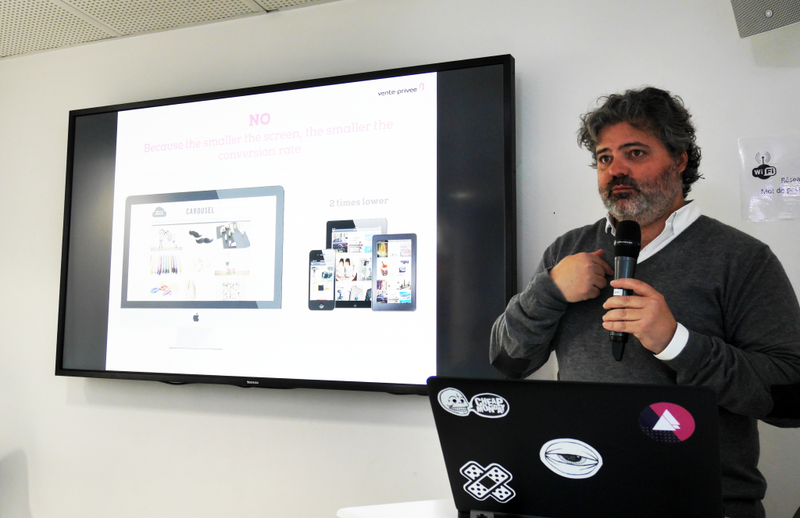 Ilan Benhaim, co-founder of vente-privée, talked about new e-commerce challenges, and how vente-privée uses its innovation strategy to address them. Unlike what most people think, Vente-privée is not a pure e-commerce player, but the digital transformation of a wholesale clearance house created in 1985 by Jacques Antoine Granjon and Julien Sorbac. At the beginning, Jacques Antoine Granjon bought branded unsold and end-of-series goods from discount stores and generated 40 million euros in sales. But when shirt makers transferred their production from France to Asia, Vente-privée was faced with a challenge. Margin is higher (90 % margin on a shirt made in Asia) but you have to take into account that a collection takes 8 months to produce and 6 weeks to deliver. As you only pass one collection per order, you need to know what quantity to order. If you plan to sell 1.5 million units, it is cheaper to order 2 million units. 15 % of goods bought and delivered remain in the warehouse. Vente-privée sells this 15 % of new products which never make it to the store, as they are replaced by the new collection. Why is vente-privée so strategic for brands? After two collections, this 15 % grows to 30 %, meaning that 30 % of the warehouse stock is unused. This is why Jacques Antoine entered this new and relatively unknown market back in 1985. But as he bought at 4 euros what the brands bought at 10, the brands were losing money. Before going digital, their business model did not enable them to be profitable. From the beginning, vente-privée was driven by quality: quality generates client satisfaction and therefore a potential re-order. The key with e-commerce is not to sell a product to someone but to re-sell it for free without having to pay fees to Google. vente-privée can also deliver a service that generates margin, which is key to remaining financially independent. Quality, volume, cost: what is the right equation? How do you maintain quality when volumes explode? Industrialization of your processes is not the answer, as it is likely to affect quality. Remember that on the web, you are selling a digital product: good quality pictures and technical information are key ingredients to successful web sales. Every year at vente-privée, we shoot photos of 1 million references. In 2008, there were not enough models available for our shootings. This was an issue as no models means no shooting and hence no sales. Using cheaper models meant that they were less pretty: this required cropping their head for the photo, which meant lower quality, hence lower sales and lower margins. This was not an option either, so the only solution was to innovate. 3D photos are not good quality and as the result is not realistic, they don’t push sales. So, we bought a Swedish company specialized in virtual models which are so realistic that you cannot tell the difference from a real one. Today we sell this technology to some of the largest retailers in the world. One of the key vente-privée ingredients to success is our invention of a profitable business model, which gives us a lot of freedom. If you raise funds, you aren’t supposed to make mistakes. If you are rich and get things wrong, this is not an issue. You learn from your experience and try again. How can you improve your conversion rate on the web? Conversion rate is a key e-commerce challenge: it stands at around 2% on the web against 20 % for retailers. E-commerce gives you the advantage of not paying rent, but you don’t get any natural traffic. 50 % of consumers go into a store with the intention of buying something, but only 20 % actually make a purchase. On the web, 90 % of people don’t buy anything! Improving your conversion rate is the only path to profit. At vente-privée, we have achieved a 12 % conversion rate. Data mining and predictive analysis: you can collect a lot of data via the web. With the big data revolution, we can access and manage a lot of data but what can we do with it? Retargeting has proved efficient for increasing conversion rates. Statistically it works, but not on everybody. Every web site collects data on their cookies, but the European commission is launching new laws to regulate cookies, as there were too many complaints and privacy is becoming a real issue. Soon, companies won’t be allowed to use retargeting without owner authorization. Artificial intelligence will never replace humans. Humans still need to control the engine and artificial intelligence is not a game changer. Today, humans are irreplaceable: algorithms have tremendous math capabilities but no learning skills. They are not able to judge if a product is beautiful or not, which is key as 90 % of purchasing decisions are irrational. This is a true trend and the path to improved conversion rates. The success of Netflix relies on their approach of asking their clients what they like: they ask them to select the 3 films they prefer from a list of 20. Why is there such a big gap between the web and store conversion rates? Logistics is not the issue, neither is the impossibility to try on the products on the web as you can try them at home and return them if they don’t fit. We believe that delivery remains an issue, as consumers tend to be absent when their product get delivered. They then need to pick it up from the post office. Relais colis are an option but not satisfying enough. Companies need to find an innovative delivery service that meets their clients’ needs. At vente-privée, we are working on the development of a delivery solution based on fixed appointments with our clients. Product return is another upstream buying breaking point: if you are not happy with a product, you need to re-pack it, return it via the post office and pay. You get your money back, but this is not what you wanted. Mobile Adoption is phenomenal, but is it good news? Not it’s not. The conversion rate is higher on PCs, standing at around 3 % or 4 %. On PCs, product presentation is better, pictures are bigger, navigation is easier with the scrolling possibility. Smartphones have many disadvantages: smaller screens, smaller pictures, shorter sessions… hence the lower conversion rate. To sell your product via mobile phone, you need to innovate. After 20 years, e-commerce only represents 5 % of total retail sales. Amazon generates more sales than the top 20 e-tailers in the US! 45 % of e-commerce business in the US is done by Amazon: this will inevitably raise anti-trust issues one day. Amazon is the only successful pure-player. Don’t even try to imitate Amazon as they have the financial means to get things wrong and to send a non-viable order. Their re-buy rate is amazingly high. Their theory is the following: the faster you deliver your clients, the quicker they re-order. This is why they propose to deliver your products the same evening, even if you do not want them. What is the purpose of the digital revolution? Each brand should have its own digital strategy and be able to identify their reasons for implementing this strategy. A brand with physical stores planning to go digital by paying Google should not do it. For me, a brand which decides to shift to e-commerce should digitalize its catalogue: 100 % of its products must be visible 7/7 and 24/24, with the prices, the description…Today brands tend to spend more money on their website than on their product pictures: this doesn’t make sense. In the US, it is estimated that 30 % of existing selling surfaces will disappear. E-commerce in the US in 2016: $327 bn: the mobile influence on purchasing in stores is twice this amount. It means that we are experiencing a traffic shifter: more and more traffic on the mobile and more purchasing in stores. At vente-privée, a lot of the products that we sell are in stores: we help brands to develop an omnichannel approach. For us, a store is a local warehouse. We believe that the global competition is no longer between the large and the small actors but between the fast and slow ones. Agility and speed are key. Even if you get things wrong, you should try. We believe that organization slows down the innovation process. Vente-privée has launched an 80 million euros innovation plan. We are convinced that to boost our conversion rate, we need to be more business orientated. Our idea is to identify non-value-added jobs so that they can be automatized, and to offer our team members great jobs. We have reorganized our company into 60 start-ups, each working on a single subject, with a dedicated budget, deadline and ROI. We finance the team for one year and regularly monitor their progress. Their objective is to be innovative and to be able to pay their teams. Agility and the right to make a mistake are key. Development and business interests should be aligned. They need to cooperate to be innovative and generate business. Historically, R&D was led by experts who often said no: today we have a team of 40 young talents (aged 21) dedicated to our R&D. We have high recruitment needs (400 people). These hires will take too long so we have decided to collaborate with start-ups to save time. We are not incubators but accelerators. We have 85 spaces at Station F, Xavier Niel’s start-up campus. Our philosophy is: if you accelerate my business, I will accelerate yours. The impulse for our innovation strategy comes from Jacques Antoine Granjon. The implication and drive need to come from the very top.